It just started pouring rain, killing any plans we had of heading up to Sacre Coeur for our weekly wine + stairs date. So instead, it’s story time. 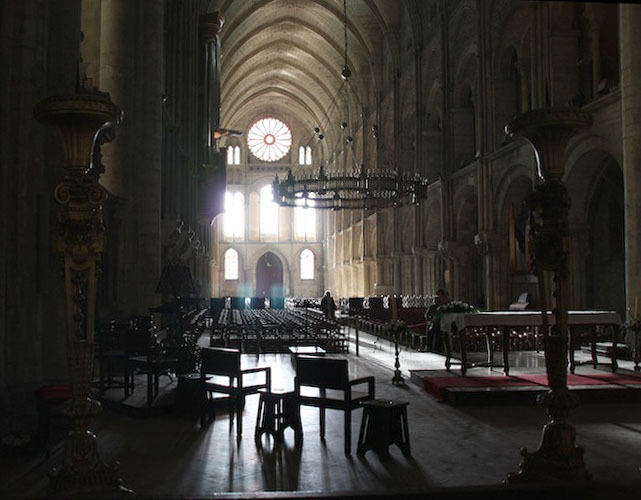 Get comfortable, grab a glass of something cold, white, and bubbly, and let me tell you about our day trip to a great little town called Reims. Around 2100 years ago, the Gauls found a town called Durocorteron. Just over 70 years later, Caesar rolled through and the town voluntarily became Roman. Their commitment was strong throughout repeated insurrections so they were well liked by the imperial power. The Romans really made this town their own by digging out long caverns to mine chalk and constructing various buildings and monuments. Lots of history happened through the next couple millennia, including the unconditional surrender of the German army in 1945, but I’ll be honest, that’s not really why we came to Reims. We came for the champagne. 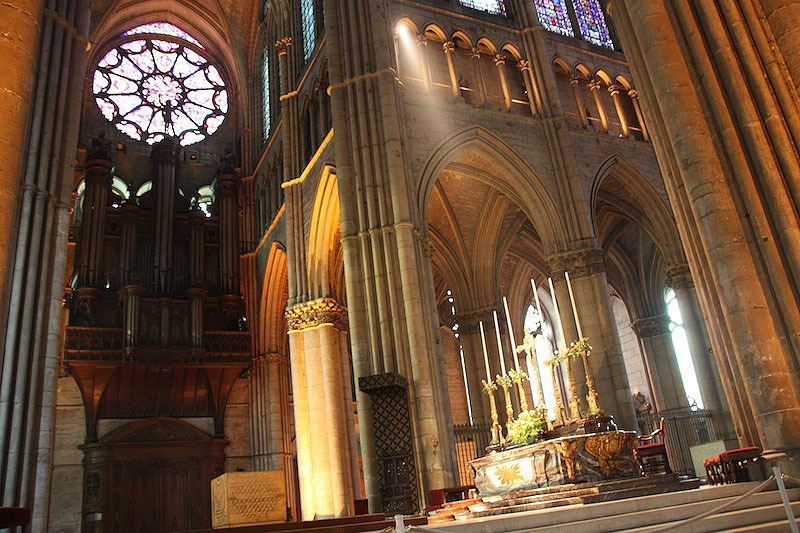 Reims is one of the central locations for champagne production in France. Both Mumm’s (pronounced “mooms”), the bottle you see wasted after an F1 race, and Veuve Cliquot, the ubiquitous yellow label you’ll find everywhere in the states, age, bottle, and label their champagnes here, as well as several other houses of various notoriety. We figured, hey, California wine is, genetically speaking, French wine but you can’t get champagne from just anywhere. So we booked our tickets a few weeks ago and went. The day started at 6:30AM to make sure we got our tickets printed out. We got to the stations with plenty of time to wander around and take photos. If there’s one thing that the French do right across the board it’s public transportation. Every station feels like a work of art and everything runs like clockwork. 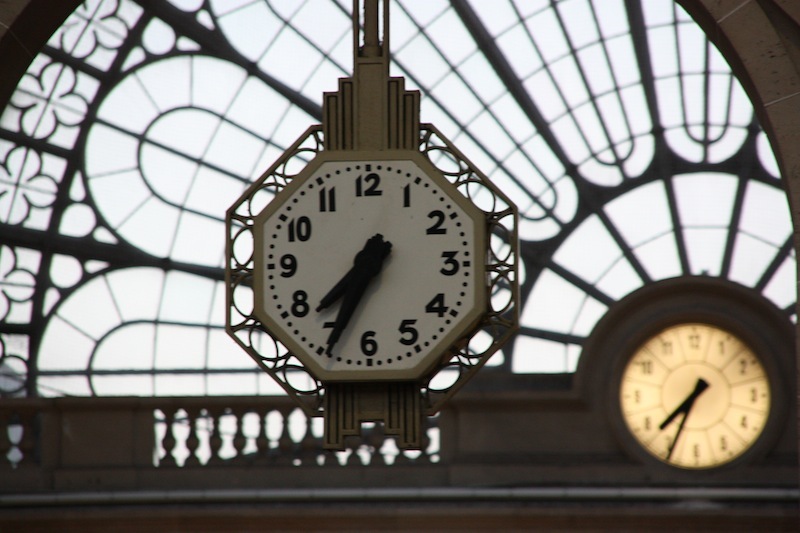 The clocks in the station display seconds and we pulled out of the station literally the second it turned 7:57. We got to Reims and hit the ground running. As you might have read in our last post, we’ve been doing a lot of walking lately so we’re quite used to ignoring buses and cabs and just making our way about town. Reims is about 2 miles end to end with an SNCF train station on one side and a cluster of champagne houses on the other. 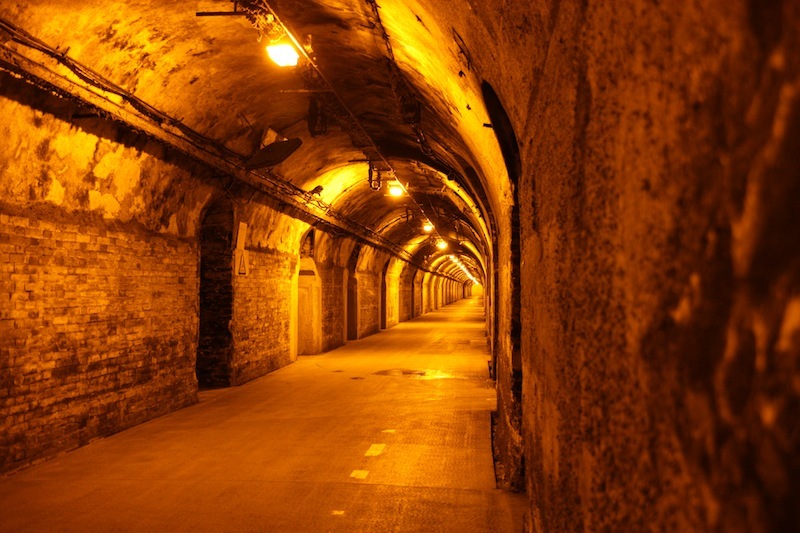 By the end of the day, we’d walked from one end to the other three times and through who-knows-how-many-miles of underground tunnels. It was painful the next day, to say the least. But, really, who wants to hear me complaining? No one. 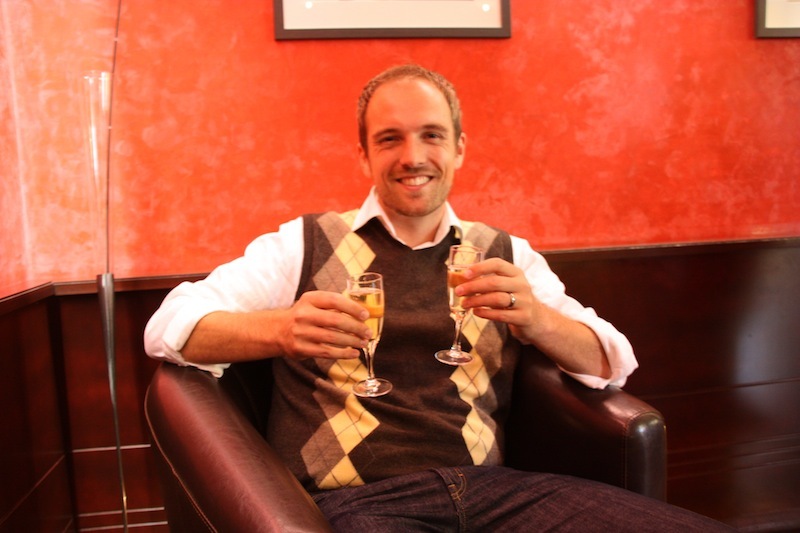 Let’s talk about champagne. Grapes (only pinot meunier, chardonnay, and pinot noir) are grown, picked, and pressed. But they aren’t just stuck in the ground, cultivated with a machine, and then smashed. The grapes are grown in special, graded regions in specific parts of the country. Geographic snobbery? Think again. Only the perfect sun, wind, climate, and precipitation can make the right grape to go into the finest champagne. The grapes are hand gathered for the top houses and the grapes are “gently” pressed, not mashed. This is done at the vineyard so the white juice is kept separate from the red skin of the two pinot grape varieties. 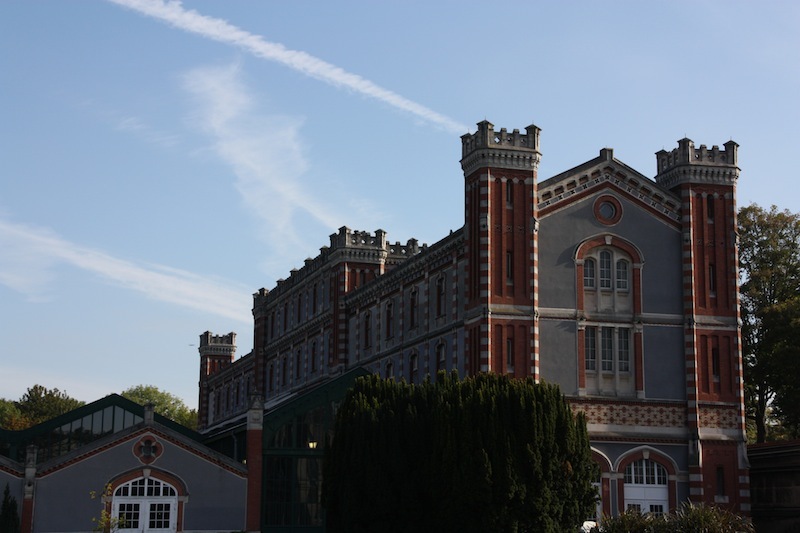 This juice is then shipped via small tacker truck to the production facility, the places you can tour like Pommery, below. The juice is fermented with yeast to create the alcohol content. This first fermentation is not much different than the one regular wine goes through. 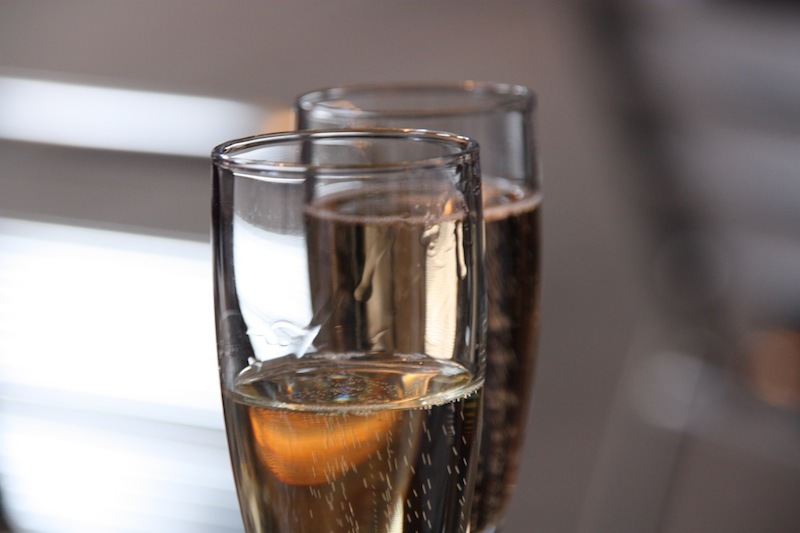 The yeast converts sugar to alcohol in a process I refer to as “making the fun.” Once the fun has been made, this wine is then taken to the experts to determine which ones they will mix and ferment a second time to make the actual champagne. 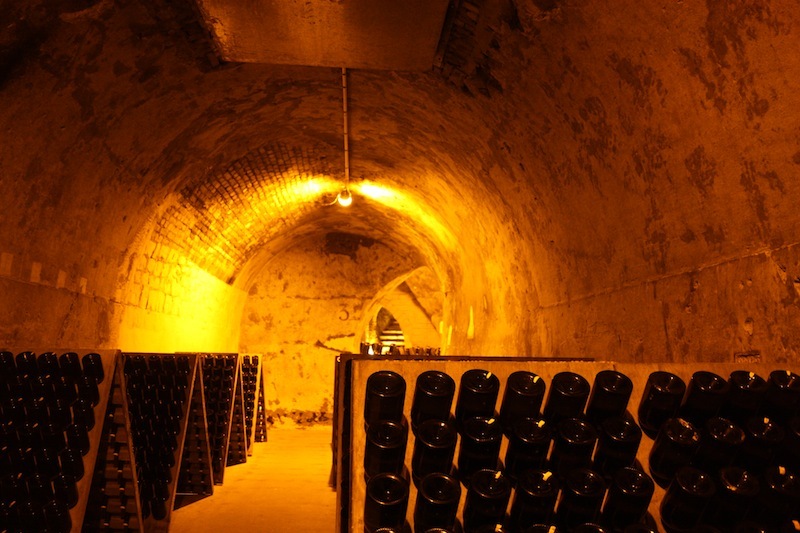 Champagne houses can produce several different pre-champagne wines, called cuvees (‘coo-vay’), which they use to make only a few different lines of champagne. It’s a level of exacting that is hard to comprehend. 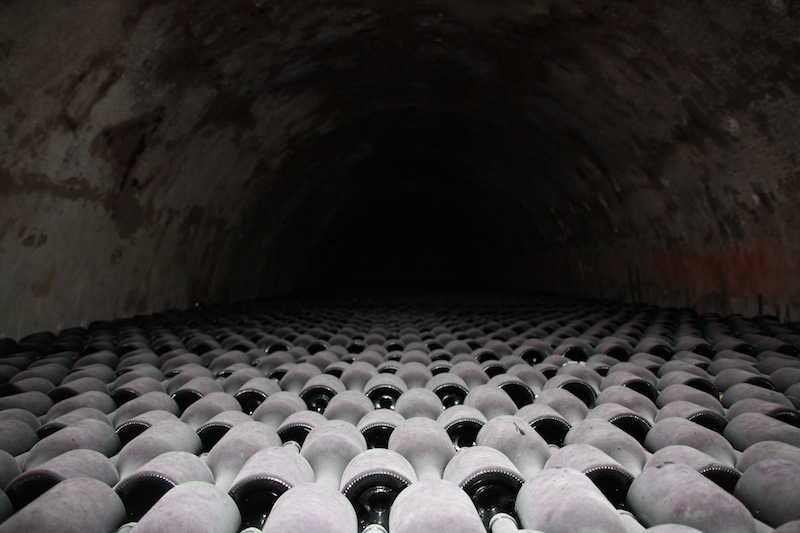 The cuvees are mixed together as determined, sugar is added, and the individual bottles are filled, capped, and stuck underground. This step is the “champagne” step where the carbon dioxide bubbles are produced. These bottles are stacked several meters underground in chalk and stone caverns (some of which date back to the Romans) for at least 15 months (this minimum is controlled by the government) and up to 10 years for the really good stuff. 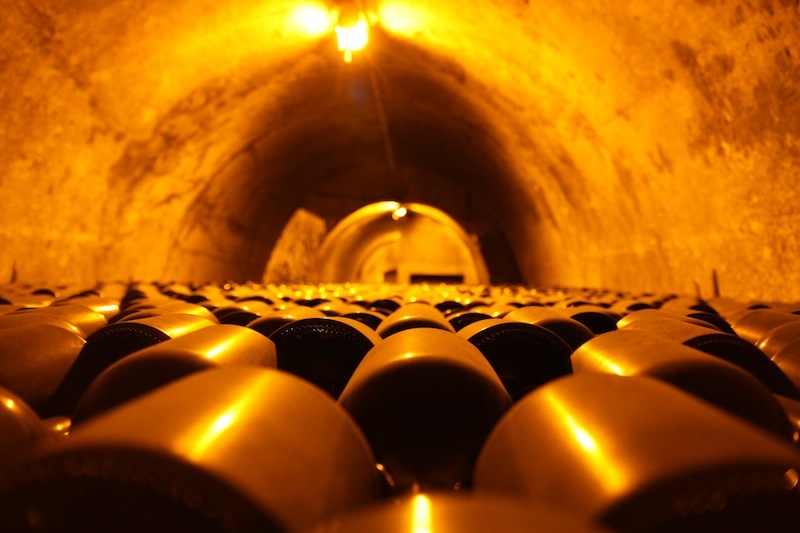 Every bottle of good champagne sits underground, stacked like logs, as the yeast does its work. It’s absolutely incredible to see up close. We’re talking millions of bottles each year for these houses. Each bottle spending well over a year at various angles to work the yeast plug down to the neck. I was standing on toes with the camera above my head to take that shot. Can you see the end? I can’t. Once the champagne has reached the proper age, the yeast has to be removed. Besides “making the yummy,” all the aging and turning and leaning moves this gross little glob of yeast into the neck of the bottle. The neck of the bottle is frozen with liquid nitrogen and uncorked, allowing the plug (and a splash of really good champagne) to escape. More sugar is added (for taste), the amount depending upon the type, and the bottles are corked, washed, labeled, and sold to rappers, untalented actresses, and other rich people around the world. About the same distance both ways from where we stood. 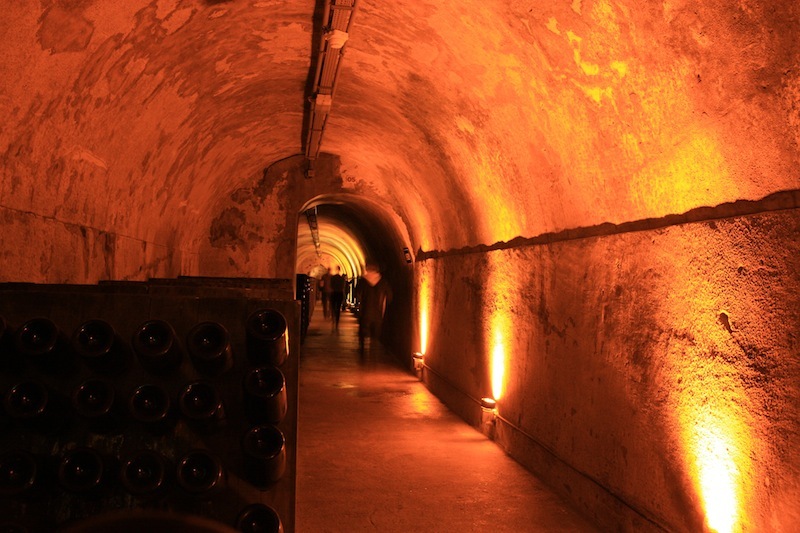 Miles and miles and miles of underground tunnels aging sparking, bubbly deliciousness. This was, in every sense of the word, a great, great day. It’s hard to beat a beautiful, sunny afternoon in France sipping expensive adult beverages and learning about such a precise and completely irrational human endeavor. We had history, exercise, bubbly beverages, knowledge, and excellent company. I think back to when we were planning this little day trip and I was whining about the cost of the train tickets and the cost of the tour and how much I had to do. To think I wouldn’t have this great day to look back on prepares me to re-think any apprehension I might have in the future towards such a unique experience. This trip has definitely changed me for the better. I guess that’s probably why people travel.